With Valentine’s Day just days away, Olfactory Scent Studio could be the perfect option for those looking for personalized gifts or interested in creating special memories with their significant others. The studio, located in the Shoppes at Arbor Lakes, gives shoppers a chance to create their own candles with over 120 different scents. “We offer premium, natural soy candles,” says Sue Brady, owner of Olfactory Scent Studio. Customers can “come in, smell, write down [their] favorites,” and go to the blending bar to create their scent, Brady says. With options such as campfire, pine needles, lavender, basil, lemon and many more, customers can create a candle that’s just right for them or their special someone. The wide variety of scents might sound overwhelming, but the Olfactory makes the decision making a bit easier by listing all the scents on its website. Customers can preview the selections prior to arrival and chose a few that stand out, and staff is happy to assist and recommend options, too. The process takes between 15 minutes to an hour. After customers have picked their scents and sent them off to the blending bar, the wax needs cooling time. Customers can leave, visit other shops or grab a bite to eat, and return to a personally created candle, which will burn for 50 to 60 hours. If creating a candle of your own seems a little too daunting, or you want to surprise your sweetie without all the guess work, the studio has special romance gift packs, which feature perfectly culled scent combinations— including rose petals and champagne; chardonnay and bourbon; and coffee and whipped cream. Pick the type of scents that best match your relationship for a gift that’s sure to stand out from the usual, tired gift options. Brady says Olfactory is also an ideal setting for date night. (Take note! The store has date night specials rolling out all month.) For Valentine’s Day, she recommends creating a “couples’ candle.” Find scents that remind you and your partner of specific moments in your relationship or even scents you both like, and marry them together to create a meaningful gift. For those with children or pets (safety concerns) or people who just aren’t interested in candles, the studio offers other possibilities. Consider reed diffusers, room and linen sprays and waxes for warmers. 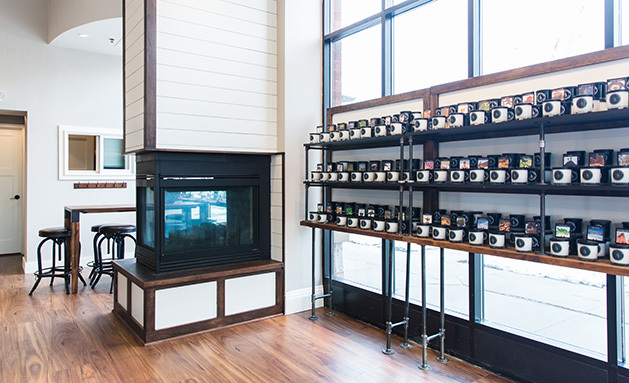 The studio even offers bath and body products, which also can be taken to the blending bar. Those with scent sensitivities needn’t be concerned, as they don’t use any chemical enhancers, which is what typically causes reactions. Product prices range from around $11 for bath and body products to up to $30 for four ounce reed diffusers. But whether you’re a self-proclaimed candle snob like Brady, or a scent novice, Olfactory Scent Studio is sure to impress. Facebook: Olfactory Scent Studio, Inc.